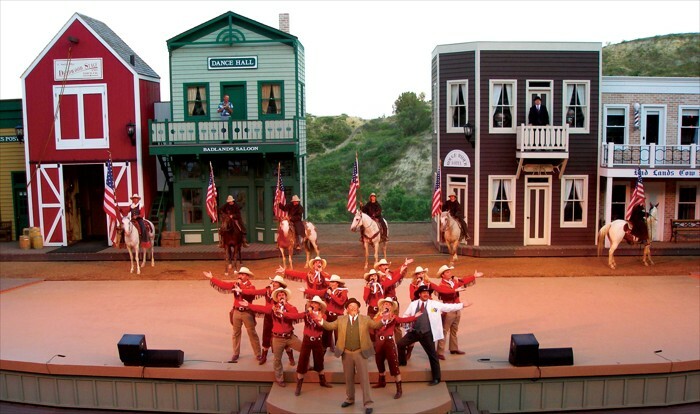 The Medora Musical is the rootin'-tootinest, boot-scootinest show in all the Midwest. There's no other show quite like it. Performed live and outside, under the Badlands sky in the 2,900-seat Burning Hills Amphitheatre, the show is dedicated to President Theodore Roosevelt's time in the Badlands and to the Spirit of the Old West. Day 1 – Depart Red Deer travelling the Saskatchewan prairie to Moose Jaw. Before leaving Alberta, we will have a lunch stop in Medicine Hat surrounded by Cypress county. Crossing into Saskatchewan we have a coffee stop before arriving in Moose Jaw where we will spend the next two nights. Day 2 – A day of excursions today starting with a tour of the Moose Jaw Tunnels. Head beneath the streets of downtown Moose Jaw and undergo two guided theatrical tours. Relive Al Capon’s bootlegging days in the Chicago Connection tour and experience first-hand hardships of early Chinese immigrants in the Passage to Fortune tour. Following lunch on your own we head to the Claybank Brick plant where we step back in time at this National Historic Site, North Americas best preserved brick making site. Back in Moose Jaw late afternoon you have a free evening. Time to visit the casino, Spa or shopping if you choose. Day 3 – Our last day in Moose Jaw starts with a city tour giving the opportunity to see the city on a grand scale. With murals depicting Moose Jaw’s early history, the antiquity of the snowbirds and spectacular sights throughout the city. After lunch you will need to make sure you have your passports as we will be crossing into the United States heading to Medora. Upon arrival we will have a complimentary welcome reception to start your experience at the Medora Musical festival. Day 4 – Our first day in Medora we start with a complimentary breakfast before heading to the Cowboy Hall of Fame. This interpretive centre features permanent and travelling western cultural exhibits. The North Dakota Cowboy Hall of Fame strives to preserve the history of all nations and cultures about the state’s rich and colorful western heritage. A coffee break will be provided before making our way to the Old Town Hall Theatre. This live, one-man show “the Wonderful Work of Harold Schafer” brings to life the incredible story of the man who kept Medora from disappearing completely. Lunch will be on your own and then you have free time this afternoon. To start our evening, we will enjoy dinner at the Pitchfork Steak Fondue, savor your steak as you overlook the picturesque Badlands from atop a bluff at the Tjaden Terrace. Before the Medora Musical we will have the opportunity to have a behind the scene tour followed by the high-energy music by the Burning Hills Singers and our LIVE band, The Coal Diggers. Day 5 – The Gospel brunch will start our day in Medora, a toe-tappin' gospel review giving you a gorgeous gospel glow and will have you humming all day long! Throughout the day we will enjoy the view of Theodore Roosevelt Park doing the scenic South Loop drive. Over 70,000 acres having the largest section lies alongside interstate 94. The Old Town Hall Theatre will provide us the historical Theodore Roosevelt salute to the Medora show. Day 6 – We drive back into Canada today following our complimentary breakfast. The morning coffee break will be in Williston, the last US stop before crossing the border back into Canada. In the southwest corner of Saskatchewan, we stop in the thriving prairie city of Weyburn for a lunch break. Driving across Saskatchewan, the only province without natural borders we make our way to Swift Current. Day 7 – Homeward bound today where we can reflect and share our experience at Medora music festival. With coffee and a lunch stop we will arrive in Red Deer approximately 5pm. Final Payment is due in full by July 15, 2019 For bookings made after July 15, 2019 payment in full is required at the time of booking. Frontier Bus Lines Ltd. Reserves the right to cancel any trip with less than 20 persons.